Well, I’ve written about Miss Malaprop, and now it’s time to introduce my other beautiful creature: Marvel Girl. There are quite a few reasons why my firstborn is referred to on this blog as Marvel Girl, not least because she is currently obsessed by everything to do with the Marvel Universe and the Avengers, and by Captain America and Iron Man in particular. Unlike Miss Malaprop, who — no doubt because of her age — is more likely to discuss these weighty topics in simplistic terms (typically, “Hulk, Smash!”), Marvel Girl is fascinated by the dichotomy between good and evil, by the characters’ back stories, by their particular powers and the price they pay to wield them. She’s too young to watch the movies yet (any of them), but since The Bloke grew up on a steady diet of comics (reading and drawing them) he tells her what he can remember about her heroes and their various escapades, while I teach her about Norse mythology and read her stories of everything from Yggdrasil to Ragnarok — with a natural bias towards anything involving Loki. And while it might be possible that she might have seen a certain video (yeah, you know…that one) from the 2013 San Diego Comic Con a few dozen times, I do have to admit that knowing my Marvel Girl can spot the God of Mischief (or Tom Hiddleston, for that matter) at twenty paces does make me one proud mamma. 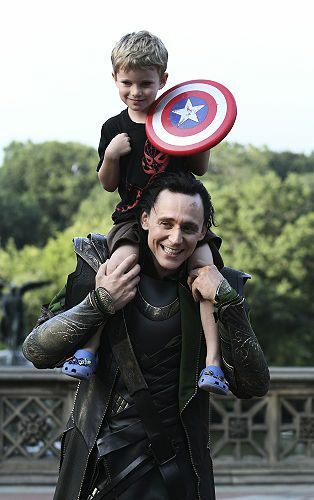 But her love of anything to do with Avengers (or my completely unabashed love of all things Loki) is not the main reason why she is my Marvel Girl. She is my Marvel Girl because she is also my miracle — the child who was born six weeks ahead of schedule, needed oxygen to get her lungs going, and spent more than three weeks in hospital before we could bring her safely home. She’s always known the story of her birth in general terms but, strangely enough, it’s something I have only started discussing with her in any detail just today, when she came home from school with a questionnaire to complete for show and tell entitled “When I was Born”. There were only three questions on the worksheet, along with a request that they bring in a photograph of them as a baby. So, after chatting to her about it for a bit and filling in answers that she was comfortable with, we had a look at some of the photos from that time. I picked out only a few to show her, briefly explaining what a humidicrib was, and why she had tubes and wires all over her, and doing my best to normalise the experience as best I could. And my Marvel Girl, bless her, took it in her stride. 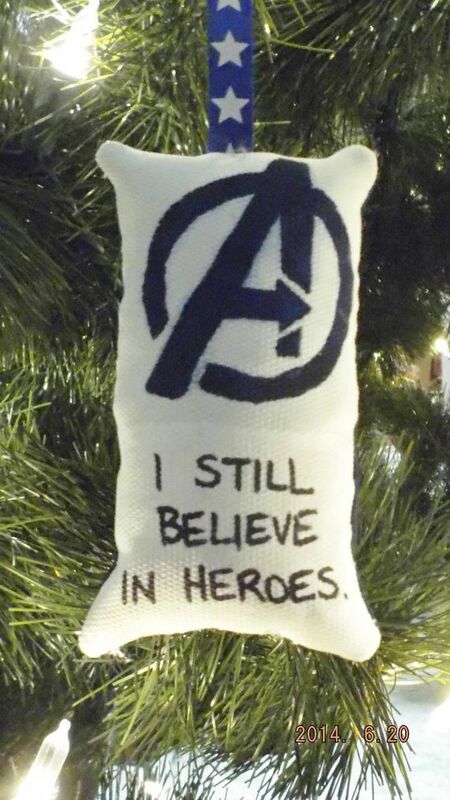 Avengers Christmas Decoration…you can get it from Etsy here. It’s such a privilege, for me, seeing her grow up. Witnessing her personality unfolding, along with her quirky sense of humour (it’s definitely black around the edges…I can’t think where that came from), watching her graceful dancing and swimming, observing her crazy, compassionate and occasionally catastrophic interactions with her little sister. It has been one of my life’s greatest gifts — knowing full well that her own life came perilously close to being over before it had even begun. I’ve learned so much from her and from the experience of being a mother to her, and to Miss Malaprop too. I can’t wait to watch all the Avengers movies with my girls — every single film and spin off! And in the meantime, I’ll keep showing them snippets of what they have to look forward to, and encouraging them to keep believing in the people and characters who inspire them, fictional or otherwise. Because I still believe in heroes. And my Marvel Girl is one of mine.